Rackers at the data-storage company are rewarded with stock options, a share of the quarter's profits, and a 401(k) match of 6% of pay. 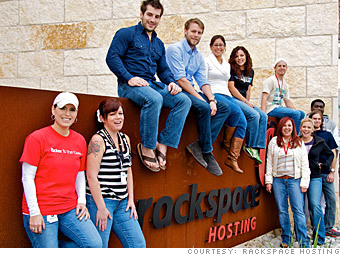 Is Rackspace Hosting a great employer, or what? N.A. : Not available. U.S. employees includes part-timers as of time of survey. Job growth, new jobs, and voluntary turnover are full-time only. Revenues are for 2010 or latest fiscal year. All data are from July 2011 and based on U.S. employees. * Average annual pay: yearly pay rate plus additional cash compensation for the largest classification of full-time salaried and hourly employees. These top employers have at least 700 openings each, totaling more than 56,000 jobs. What are they looking for? Devon Energy engineers take home an average $178K annually. Who else offers big paychecks? These Best Companies are stepping it up to keep their employees happy. Here are 12 firms with unusual perks. These 14 employers survived a struggling economy while staying loyal to their workers. Interesting assignments, mentoring, even losing 20 pounds: No wonder these folks love their workplaces. The Internet giant is well-known for showering its employees with envy-worthy benefits. These Best Companies are using Facebook, LinkedIn, Twitter and other social media to get even better. Can CEO Tony Hsieh create a Las Vegas version of Silicon Valley in the heart of old Sin City? Want to work at REI? Gear Up! Can CEO Tony Hsieh create a Vegas version of Silicon Valley in the heart of old Sin City? Google, No. 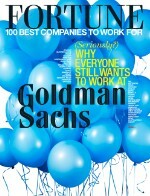 1 on the list, brings its famously fun work culture to a town of 9,000 in the middle of Oklahoma. Salesforce's CEO is funding a new children's hospital in San Francisco that he expects to be the best in the world. Select benefits you want and see instantly which Best Companies offer them. What qualities are you looking for in a great employer? Use our tool to find the companies on our list that suit you best. Marc Benioff is funding a new children's hospital in San Francisco that he expects to be the best in the world.